José stands among the straight rows of crops that he’s been cultivating all year long in his school garden, proudly surveying the healthy cabbage, carrot and radish plants that are growing through the rich soil. This 11-year-old eagerly waits every day for his teacher to reward the class for good behaviour by letting them into the garden to get their hands dirty. José has found his niche among the plants. Coming from a large family in La Paz, José used to help his parents, aunts and uncles in the garden on their family plot. “Before, I only used to plant potatoes and beans,” he told us. 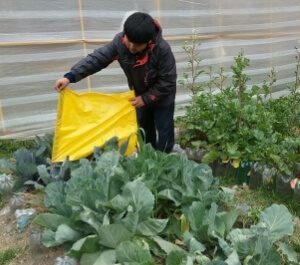 “The land was shared between families and there wasn’t a lot of space to grow different kinds of vegetables.” He also wasn’t using proper gardening techniques to protect his crops or prepare the soil effectively. Bolivia is a food-insecure nation and the most impoverished country in Latin America. Over 80 per cent of rural families in Bolivia live below the national poverty line, which is a leading cause of childhood malnutrition. This is why CFTC, with the help of local Bolivian partner Fundación Alternativas, is bringing gardens to the classroom to supplement healthy foods for children. 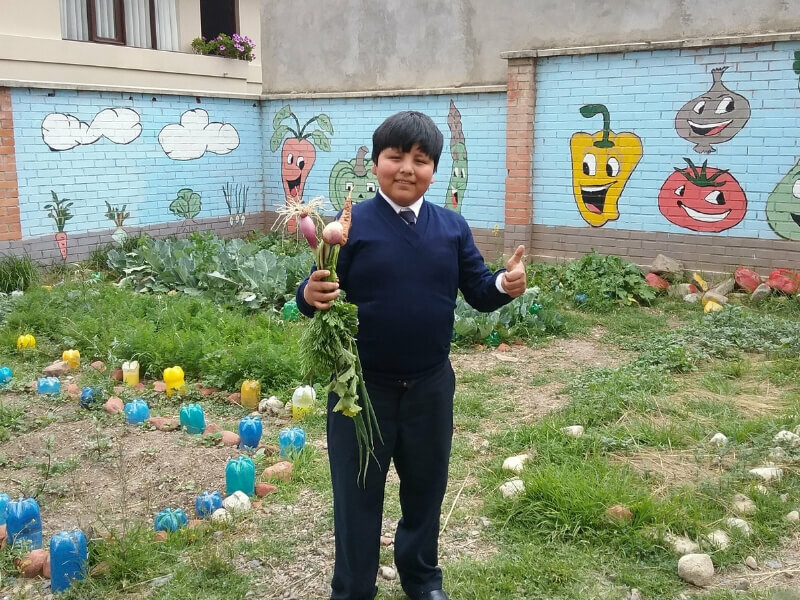 Because of kind donors, José and his classmates were able to learn vital gardening skills and incorporate more healthy foods into their diets. When José began getting his hands in the dirt of his classroom garden, his knowledge grew alongside the seedlings he planted. 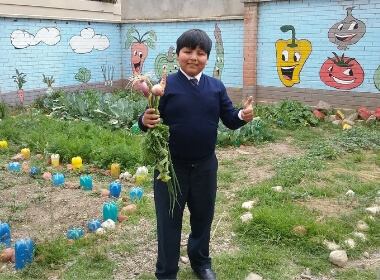 José and his classmates learned how to care for a garden to ensure that the seeds will turn into healthy and fruitful plants, including how to make a homemade insecticide from garlic, soap and chilis and how to properly irrigate the garden. And the best part is that José and his classmates get to enjoy all the veggies that they grow by harvesting the crops and turning them into their own salads! 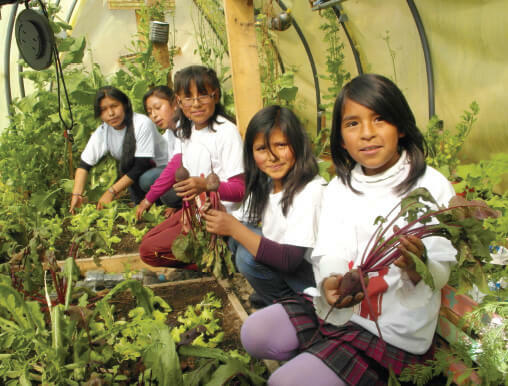 School gardens in a food-insecure country like Bolivia help to promote proper nutrition, build lifelong skills, and increase knowledge about nutrition for students. The produce grown in these gardens supplements school feeding programs and increases access to healthy foods. Healthy foods regularly incorporated in children’s diets will build good eating habits and teach children to make good food choices. 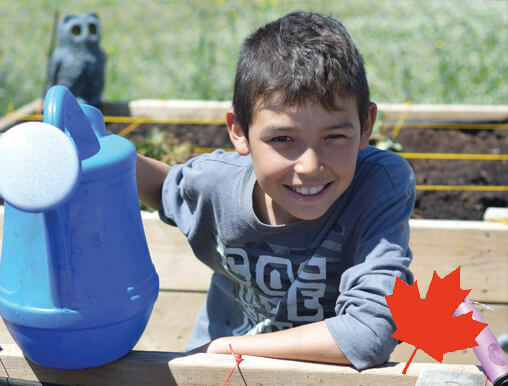 Supply a classroom with indoor garden supplies for students to learn about growing healthy foods and prepare for planting in their school or community garden in the Spring. An urban garden provides a family with the materials they need to grow their own vegetables – helping to combat hunger and put healthy food on the table. Give monthly to sponsor a child and make sure their needs are met.